For everyone who hopes to own a custom by Doktor A one day, here’s your chance! 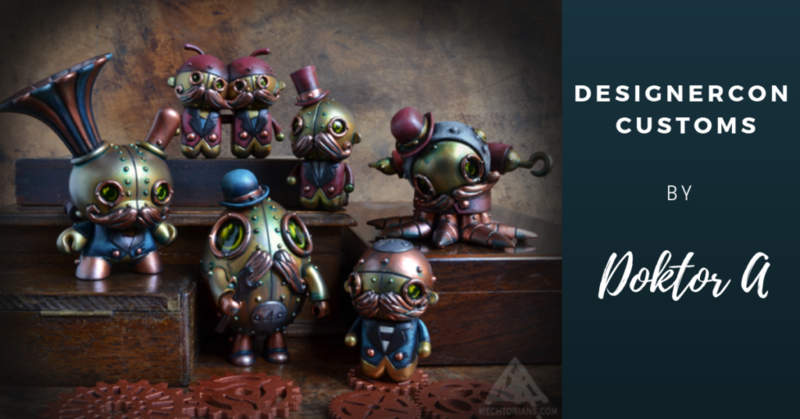 Once again Doktor A has created a wonderful range of customised figures for DesignerCon. From a Qee Egg to a custom Greg Simkins figure, there’s something for everyone. As a Dunny collector the customised Dunny is my favourite, but you can’t deny the fantastic details on each of the pieces. From the little top hats to their shiny mustaches, they’re all wonderful characters with a unique personality. All the pieces are around 3″ tall (7,5 cm) and will cost between $100 to $150 (£77 – £115). They can be bought at DesignerCon where some (but not all) will be available on preview night. The rest of the figures will go on sale when the DesignerCon doors open for everyone. Any remaining customs will be offered online after DesignerCon.